It’s never an easy thing to be diagnosed with a gluten intolerance and it has to be especially hard when you’re Italian and pasta is part of your DNA. But when actor Stanley Tucci was recently diagnosed with a gluten intolerance he turned lemons into lemonade and embraced quinoa as a healthy substitute. 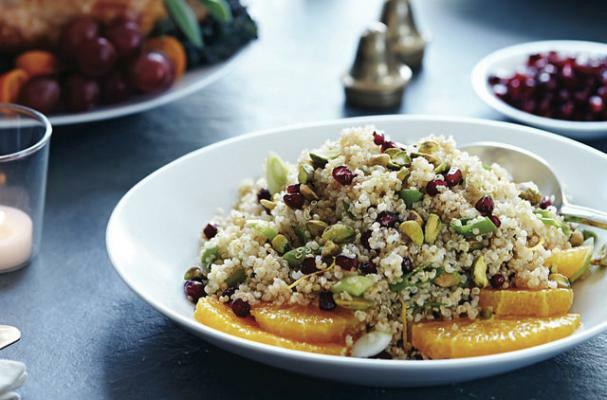 This gluten free salad recipe is the creation of his wife who adds a splash of lemon juice, pomegranate arils (seeds), pistachio nuts and green onions, creating a dish that pops with flavor! Garnish it with freshly sliced orange rings for even more festive flare during the holiday season. Step 1: Rinse the quinoa in cold water to remove its bitterness. Step 2: Bring 4 cups of salted water to a boil. Add the quinoa, reduce the heat to low, cover, and simmer for 15 to 20 minutes. Dress with the olive oil and lemon juice, season with salt and pepper, and set aside to cool. Step 3: Gently mix the pomegranate seeds, pistachios and scallions into the quinoa. Taste and adjust the seasoning. Step 4: Serve with sliced oranges dressed with olive oil, if desired.